The DC area is full of azaleas. Some yards are an absolute riot of hot pinks and purples right now -- mostly with azaleas bred from Asian species. But there is actually an azalea native to this area, and it's quite showy in its own right. 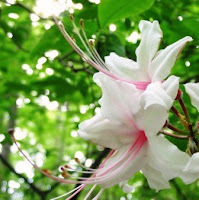 Pinxter (or Pinxterbloom) azalea, Rhododendron periclymenoides, has a looser habit than typical cultivated azaleas, and its light pink blooms are a little sparser. But the blooms are incredibly showy, with long stamens and an even longer pistil that swoop out far beyond the petals. You can tell it's going for the large pollinators: butterflies and hummingbirds. The name Pinxter actually doesn't come from the color of the flower; it comes from the Dutch word for Pentecost. In this area, the flowers may be looking a little ragged by Pentecost (50 days after Easter). It all depends on the weather and on where Easter falls on the calendar in any given spring. I suspect in New York, where the Dutch settlers who gave the name were presumably observing it, the slightly later growing season makes it a perfect name. In your yard: Pinxters lose their leaves over the winter, unlike the asian azaleas -- probably a key reason that they're not popular as a landscape plant. But we think they're worth growing. The pinxter we planted here at Natural Capital headquarters (aka our back yard) struggled for the first year after we planted it, but is blooming nicely this year. Like all azaleas, they want acidic soil. Try a spot with light shade; you want enough light to encourage blooms, but plenty of protection from the summer heat. In the wild: There are several pinxters along the Valley Trail in the northern part of Rock Creek Park, like the one pictured to the left. Our favorite is on a bluff looking over the creek north of Holly St.